As a Tour Director you will lead CruiseTour guests throughout Alaska and the Yukon, acting as a traveling concierge for groups of 35-52 guests. You will be responsible for taking care of every detail of our guests’ vacations to ensure a Five Star experience. Our Tour Directors tell us they find the position extremely rewarding, often returning for multiple seasons to work in a team environment alongside Driver Guides, Guest Service Hosts, Front Desk Staff, and other company employees to provide a seamless tour experience for every guest. Housing Type: Employees are required to provide their own housing in Anchorage, AK (the Tour Director’s home base). Employee Housing is provided in all other locations when the employee is on tour. Transportation: Options are available; speak to a hiring manager for more information. As a Tour Director Supervisor, you will assist the daily field operations in the location that you are assigned by management. These locations will be your home base for the season. As a Supervisor you will be performing many entry level management tasks such as tour performance auditing, administrative paperwork and supporting Tour Directors in the field on a daily basis. Our Supervisors tell us the job has equipped them in developing leadership skills such as effective communication, trouble shooting and problem solving collaboratively and independently and developing strong interpersonal skills by working closely with employees, colleagues and other managers within the company. Transportation: Air transportation from your hometown to assigned supervisory location is provided. Return flight is also provided upon completion of contract. Journey Specialists travel aboard one of the two Holland America Line Northbound Glacier Discovery sailings, departing Vancouver, BC and disembarking in Seward, AK. 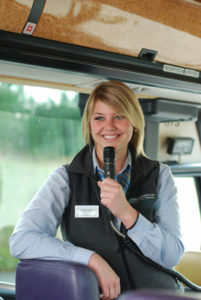 As a Journey Specialist you provide assistance to all Land & Sea Journey guests onboard by holding informational seminars that explain what guests can expect on their Land Tour. The Journey Specialist also interacts with the ship staff and plays a crucial role in facilitating Seward disembarkation. Journey Specialists find the job rewarding due to the collaborative relationships they build with both ship and land staff, the supportive but independent nature of the position, and the chance to utilize their public speaking and customer service strengths. Housing Type: Employees are required to provide their own housing in Anchorage, AK or Seattle, WA (the Journey Specialist can choose which city will be their home base). Employee housing is provided by the company outside of their home base. Be collaborative- we work as part of a team: With our co-workers our driver-guides, our front desk staff, our service staff, the ship staff and more. Must be at least 21 years of age by May 1 of the current season. Must be able to obtain a CPR and first aid certificate prior to the season. Must be able to lift baggage weighing up to 55 lbs. Tour Directors and Journey Specialists: must be able to commit to a full season between May 1-Sept. 20 (approximate). Must be able to attend all required training. Supervisory or leadership experience preferred. Must be comfortable with public speaking and providing presentations (using PowerPoint) for up to 300 guests and working independently. Escorted Tour Operations employees are the only HAP Alaska-Yukon employees who have the privilege of traveling all over Alaska and Yukon Territory, Canada. Supervisors and Land-Sea Journey Specialists are eligible for a performance based bonus upon completion of their contract. Escorted Tour Operations employees have the opportunity to experience optional excursions at a discounted rate. New and returning employees have an opportunity to earn a cash bonus for recruiting potential employees to the company. Both the referring employee and the prospective referral need to complete their entire contract for the bonus to be paid out at the end of the season. Furthermore, the prospective (referred) employee MUST put the name of the person that referred them on their application and employment agreement for that person to be eligible.